Huntsmen are humanoid Daedra in service to Hircine. Little is known about them, besides that they wear the skins of their kills as their armor and are considerably bloodthirsty. They are native to the Hunting Grounds and March of Sacrifices, and can also be found in the Maelstrom Arena's fifth round, the Rink of Frozen Blood. Upon death, they drop Daedra Hearts. In the March of Sacrifices, they wear armor and weapons of the Huntsman Style. The helms and shoulders worn by Huntsmen in the Hunting Grounds/Maelstrom Arena are from the unique Hawk's Eye set. 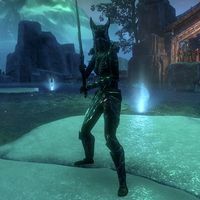 The rest of their apparel is light armor in the Daedric Style. Like other humanoid Daedra in the game, they use the features of other races as a basis (looking similar to Bosmer, Bretons, and Imperials). 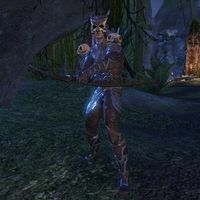 The Herne are Daedra described as hunters also in service to Hircine, though they are not the same creatures since the Herne that appear in-game have a different appearance. This page was last modified on 2 February 2019, at 04:32.